Good quality and color is exactly as pictured. Instantly create hidden storage space under your bed with this stylish bedskirt. The pleated corners and sleek fit give your bedroom a modern, streamlined look, while the chocolate brown color complements a wide variety of decor styles. Constructed of a durable blend of polyester and cotton, this bedskirt can be machine washed and dried for easy care. On the whole I am happy with this white bedskirt. It is nicely made, the pleats and corners hung very nicely once I steamed out all the wrinkles. It has a full 18 inch drop. The fabric has a kind of sheen to it, and it is not what I would call "crisp" but soft. It is somewhat thin, which is why I didn't give it 5 stars....but it is not see through. This was a good price for a bedskirt with an 18 inch drop, so considering the price, I think it is a good product. the perfect 18" drop bedskirt! This bedskirt fit our tempurpedic king size bed perfectly! The drop was even and nicely stitched all the way around. The color was exactly as pictured/described. This was a great purchase - quality at a good price. The material of the bedskirt is good quality not thin as many are. 18 inch drop works great with thicker mattresses. Wasn't sure what I was gonna get but i'm very pleased. Purchased a 18 inch high profile frame for my California King and needed to cover the frame. Did the job very nicely. The bedskirt seems nice but it is not dark brown. Didn't take it out of the package. Was looking for more of a dark chocolate brown, this one is milk chocolate for sure! 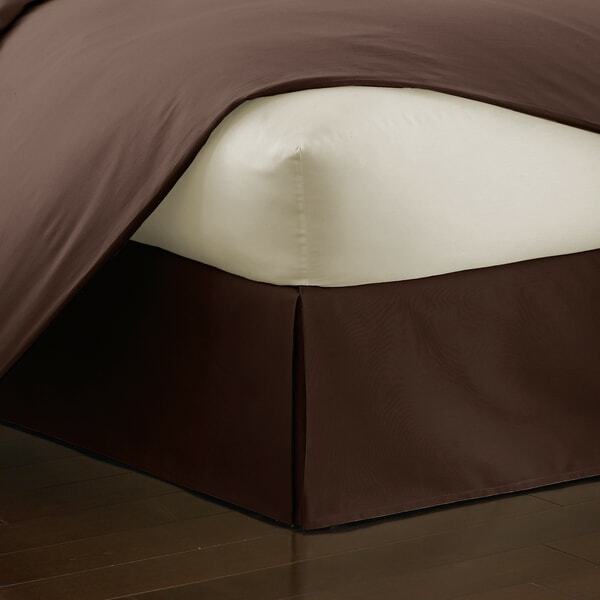 This 18" drop bed skirt, received in a dark chocolate brown, is a good fit and the fabric has a quality feel. Very happy with it for my guest bedroom. Had a hard time finding the 18" drop in chocolate and for a full (double) bed, so was happy to find this one at a good price. We have loved this bedskirt! It's nice and long for our higher bed...and it's soft and easy to wash. This was a perfect length for my bed and just the right color to match my new (Overstock) duvet set. In other words it was great. Great bedskirt. Fit my needs perfectly. Perfect size for our guest room bed and went well with a jacquard heavy spread. My only complaint is that it was VERY wrinkled. But a quick wash and dry took care of that. Perfect fit! Definitely recommend ! I love how the length is perfect for my king size bed. Skeptical about ordering online because of length , but not anymore! Already have received compliments on it. Good quality fits great great price!!!! Hangs well and doesn't wrinkle. "IS it available in white queen!!" No, it is not available in that size and color. "Are you going to be having this bed skirt in king size/white again, soon?" We hope to restock this item in king/white if it becomes available again. Please check back with us periodically. need longer drop skirt and the right color. "Will this bed skirt accommodate a poster bed with split corners? Also does this come in white?" Hello beckyinco, The skirt should accommodate poster beds that have room between the posts and frame for the skirt to drape. White is an available color for this product, but only chocolate is currently in stock. Thank you for shopping with us.Thanks for shopping with us! "Has the white version of this product been discontinued?" Hello gregz3, unfortunately this item is out of stock. We currently do not have the inventory to check, and cannot guarantee the item will be restocked. Thank you for shopping with us. "Do you have a queen in brown coming in anytime soon?" Items are restocked as they become available, however we cannot guarantee an Item will be restocked.